For questions or more information about any of our products and services, please email or call us at 877-843-0183. 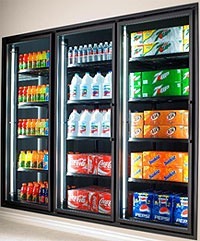 Our specialties are convenience store design, walk in coolers, and more! Call the professionals at JayComp Development, convenience store design consultants, to give your walk-in coolers a Bright New Efficient look with Anthony Doors! Style, Eye Appeal and Performance taken to new heights! With Anthony Doors, you will see New Innovative Design Ideas and Merchandising opportunities to impress your Customers! 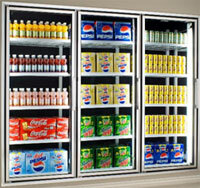 Contact us today to design your new walk-in cooler with high-efficiency commercial refrigeration. Our commercial coolers are second to none, and we design to meet your needs! The new and improved Anthony Model 101 Series sets an even higher standards for performance and energy efficiency in reversible cooler and freezer doors, with narrow door rail available for maximum product visibility. Model 101 offers ENERGY-FREE or standard cooler doors, and energy-efficient freezer doors with heat-reflective glass coating for additional energy savings! of frames and doors for walk in cooler and freezers offers easy-to-install packages complete with shelving, lights, and continuous frame lineups these products are produced to Anthony’s high quality standards. Anthony’s Eliminaator Series now available in two door & frame rail versions- standard (ELM1) or curved (ELMC) – both highly energy-efficient for walk in cooler and freezer applications. The Eliminaator doors easily retrofit to most Anthony frames, These eliminate all glass heat in the doors, offer impressive energy savings and fast payback on investment. 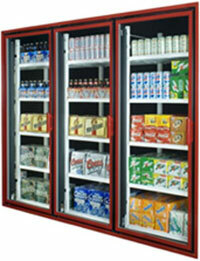 The Eliminaator2 Series offers the first aluminum-rail freezer door energy-free! 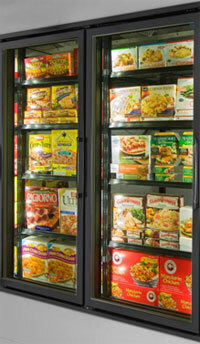 Anthony’s advanced technology completely eliminates all heat in its cooler in cooler and freezer doors. The Eliminaator2 door will retrofits to most Anthony frames, the Eliminaator 2 offers huge energy savings and incredibly fast return on investment. 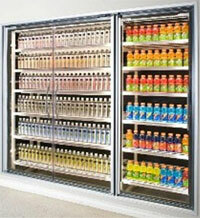 Anthony’s Model Vista Walk In Cooler Doors are the ultimate display door for product visibility on the market. Available in double-door or single set, this product delivers visibility to create a barrier free display between the product and the customer. Great for Convenience Store Design, Supermarket walk in cooler, and Floral Cooler Displays. Anthony’s Model 2100 Designer Series offers a unique energy-efficient Model 101 frame and our top-of-the-line glass doors with brightly-colored silk screen glass borders with matching handles. These doors are Available for walk in cooler and walk in freezers, these stylish doors present “all glass” appearance with eye-catching colors to enhance store design and add visual impact to the products displayed behind each door. Give your walk in cooler display Color and Contrast!